Bertram N. Brockhouse worked as a radio repairman after graduating from high school, and served as an electronics technician in the Canadian Navy during World War II. With funding from Canada's Department of Veterans' Affairs he was able to attend college after his discharge from the Navy, earning his doctorate in physics at the University of Toronto in 1950. He found work at Canada's Chalk River Nuclear Laboratories, where he used neutron spectroscopes to disperse radiation, visible or invisible, into its component wavelengths for analysis. In 1951, he proposed the construction of a device to utilize a neutron beam as a spectrometer to probe crystal structures as well as metals and minerals. 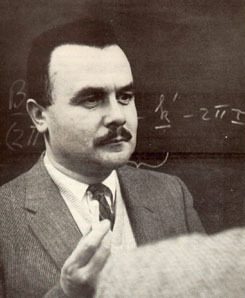 His triple-axis crystal spectrometer first became operative in 1956, and allowed Brockhouse to develop a technique known as inelastic neutron scattering, to study the scattering of neutrons bombarding atoms in a crystal lattice, measuring the energy lost or absorbed from assorted atomic collisions. His work had a major impact on the theory and scientific understanding of the physics that govern solids and liquids, and found practical applications in areas ranging from computer design to infrared detectors. Brockhouse shared the 1994 Nobel Prize with American physicist Clifford G. Shull, who conducted related work independently, using neutron probes. The time lag between the honor and the work which earned it — some four decades — is among the longest on record. His phone's ringer was off when the Nobel Committee called from Sweden, and Brockhouse said that he played the message on his answering machine several times in disbelief. He later joked that he thought his work was of mere minor importance, but changed his mind after he won the Nobel. Cooperative Commonwealth Federation (CCF) and, later, New Democratic Party of Canada (NDP).